B2L-CargoCare.com > News > B2L Cargocare > Moving Containers Globally? Let’s Stick Together! Moving Containers Globally? Let’s Stick Together! Container shipping is often thought of as the ‘glue’ which keeps the world economy turning, providing a low unit cost way of moving both manufactures and a range of other goods between producers and consumers around the world. As such, container ports and terminals are crucial nodes in the world’s transportation system, and their sheer number and ubiquity merits a close look. Container shipping has come a long way since the voyage of the Ideal-X back in 1956, and today almost every corner of the world is connected via the box transportation network. This is made abundantly clear when looking at the sheer reach of today’s container shipping services. 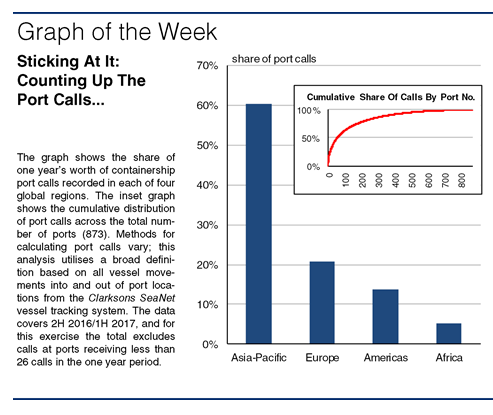 Taking a snapshot of one year’s worth of containership port calls (see graph description for details) reveals that there are 873 ports around the world which received regular calls (the number may be even bigger if non-fully cellular liner vessel port calls were also included). These ports span a total of 141 countries and on an annual basis represent an impressive total of over 560,000 individual port calls. That’s one very sticky glue! The Asia-Pacific region is responsible for 42% of the number of ports and 60% of the calls (see graph), with China representing 19% of all calls alone. Rapid economic development, outsourcing of manufacturing and multi-location processing of goods have put Asia firmly at the centre of the container world. Europe is the next largest featured region with 28% of the ports and 21% of the calls, followed by the Americas and Africa. Taking a closer look, it is apparent that a fairly limited group of ports accounts for a very significant amount of the activity. The top 50 box ports by number of calls account for 47% of the total calls and the top 10 for 22%. These are often the ‘mega-ports’ serving as hubs or key ports for major geographic areas. In all, 118 ports received over 1,000 containership calls in the year, headed by Hong Kong, Singapore, Busan and Shanghai. Moreover, the major ports account for most of the big ship action. Of the 69 ports that received a call from a vessel of 15,000 TEU or above, 44 are in the top 100 ports ranked by number of calls. However, the distribution of calls also has a ‘long tail’ (see inset graph). 65% of the ports received less than one call per day. 44% of the ports didn’t receive a call from ships other than those below 3,000 TEU in size and 13% did not receive a call from a vessel of 1,000 TEU or larger. This latter aspect illustrates the density of intra-regional and feeder networks based around smaller ships, and how today’s container shipping system connects the whole world, not just parts of it. 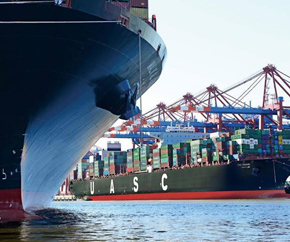 The focus may be Asia-centric and the major box ports may dominate the big ship scene, but under the bonnet is a huge mass of global interconnectivity. It really seems true that, wherever you are in the world you’re never too far from a box port!